As well as being a hugely influential musician Ashley Hutchings is a natural raconteur and an elegant wordsmith and here he’s built on his previous touring show (captured on the album ‘From Psychedelia To Sonnets’ in 2016) to put something together specifically about the early days of the band he founded: Fairport Convention. Part book reading, part anecdotal reflection, part theatrical performance, part quiz show (!) and part full-on folk-rock concert, The Beginnings Of Fairport Convention is a two-hour show celebrating Hutchings’ period with the band 1967-69 and the four iconic albums they released. There’s anecdotes, too, of course: the band’s first gig, Jimi Hendrix asking if he could jam with them one night and, for their second album, Sandy Denny joining. After a short break the band return and Hutchings talks us through the band’s evolution from ‘Britain’s Jefferson Airplane’ to the pioneers of English folk rock, following the band’s tragic crash on the M1. Hutchings recalls the weeks spent poring over manuscripts in the library next door and the revolutionary sounds they began to create together rehearsing in the Hampshire countryside ahead of the recording and release of the iconic ‘Liege and Lief’ album. The unforgettable instrumental from that album (‘The Lark In The Morning’ Medley) is recreated together with a beautiful version of Richard Thompson’s and Dave Swarbrick’s ‘Crazy Man Michael’. Becky Mills, who performs on the aforementioned ‘From Psychedelia To Sonnets’ album, does a beautiful job throughout the evening performing songs once sung by Sandy Denny, Judy Dyble and Iain Matthews. Ashley Hutchings “the single most important figure in English folk rock” as Bob Dylan puts it, has more than earned his right to celebrate the legacy of the band he helped create in this way and, with the help of some talented musicians, gives us a very entertaining two-hour show. Although there have been many, many different versions of folk rock stalwarts The Albion Band over the decades, its seasonal variation The Albion Christmas Band is now into its sixteenth annual tour with the same line-up. This could be due to the respective personnel (Ashley Hutchings, Simon Nicol, Kellie While and Simon Care) getting fifty out of every fifty-two weeks off from one another every year, joked Nicol. They produce a simple but very effective sound based on electric bass, acoustic guitars, melodeon and percussion with vocals shared between the four. I’ll be upfront that my attachment to religion is somewhere at the Richard Dawkins end of the scale. But just as you don’t need to believe in wizards to enjoy prog rock, you don’t need to believe in Jesus to enjoy a few Christmas songs and carols. This is especially true if they are played and sung as well as they are by the Albion Christmas Band. We get to some classic carols later but one of the early songs tonight is The King. The “king” in this case is not Jesus but rather the wren, the song being based on the winter old custom where a wren was placed in a garlanded box and taken door to door. As well as his founding role in Fairport Convention, Steeleye Span and The Albion Band, Hutchings is also acclaimed for his album Morris On. And we get a selection of pounding Border Morris tunes tonight which, unlike its Oxfordshire counterpart with its focus on spring, the variety along the Welsh borders always had strong associations with winter festivities. Mad World is a song by 80s synth-pop act Tears for Fears and for a while was constantly on the juke box in the refectory at my sixth form in Preston. It was then given a bleak but very effective stripped down makeover in 2003 and became a surprise Christmas number 1. And now The Albions have given it the folk treatment. Beautifully sung by While it was one of the real highlights of the evening, even though its connections to Christmas are tenuous to say the least. Part of the band’s set is usually given over to Christmas readings of one sort or another. These have included historical excerpts describing a variety of Victorian Christmases and big family celebrations in rural village inns. Tonight Nicol got to do a modern take on the nativity. 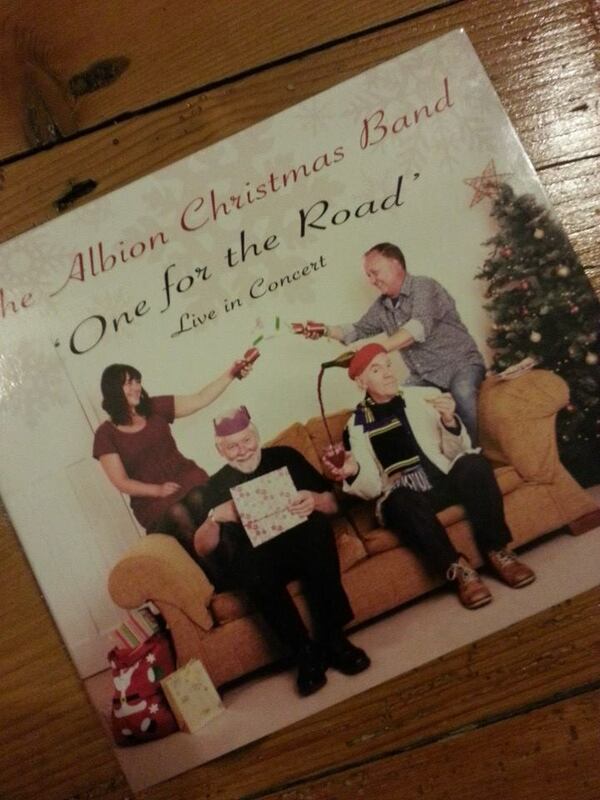 It all got a bit passé and UKIP-y (in a “they’ve-banned-Christmas –political-correctness-gone-mad sort of way) and seemed a not particularly funny and un-necessary diversion from the Albion Band’s uplifting brand of Christmas magic. The same could not be said of Christmas 1914, a song written by Mike Harding which is a poignant and moving commemoration of the famous Christmas truce, told from the perspective of an ordinary British and ordinary German soldier as they “lost the will to fight.” There was also a good selection of more well-known songs, too, including a lovely rendition of In The Bleak Midwinter and a rousing sing-along in We Three Kings. The venue is a beautiful modern performance space, the singing and playing is great but in some ways there seemed to be slightly less of a buzz in the air than when the band played the same venue this time last year, available now as a newly-released live album. Of course, last year had the added sparkle of Ashley Hutchings being presented with his Gold Badge Award from the English Folk Dance and Song Society by the renowned 60s/70s record producer (and discoverer of Fairport Convention) Joe Boyd. But, if you set aside the laboured attempt at satire it was a great evening with great music.